The Independence is based on our best selling model the Pioneer this simple and efficient stove is capable of 90,000 input btus which will easily heat most 2,500 Sq ft. homes. We developed this design for the prospective Anthracite Coal stoker customer who prefers a simpler and less expensive stove. 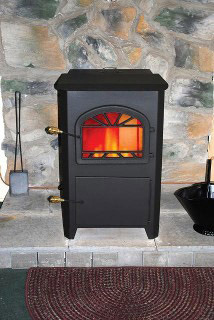 With it’s manual fan and feeder adjustments, this stove is equally suited for the home or shop. While less expensive than it’s close relative the Pioneer, the Independence is not short on capability. With it’s 265 CFM blower and optional duct top it can easlily be adapted to heat any configuration home.